The Malabar naval exercise involving the India, US and Japan is designed to "target" PLA (People's Liberation Army) submarines in the East and South China Seas and to back America's Asia-Pacific rebalance strategy, a Chinese media report claimed today. "Such a large-scale military exercise was obviously designed to target China's submarine activities in the East and South China Seas in recent years, promote the US rebalance to the Asia-Pacific and cement the US presence in the region," an article in state-run Global Times said. 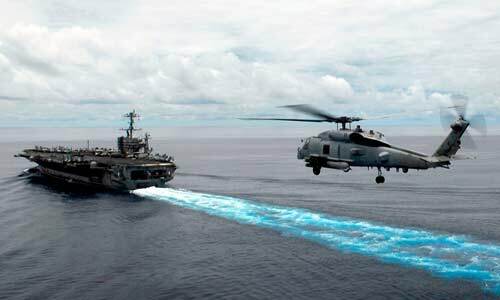 Highlighting comments by Vice Admiral Joseph P Aucoin, commander of the US Seventh Fleet stating that India, Japan and the US are set to focus their next round of Malabar exercise on anti-submarine warfare, it said the drills aimed at jeopardising peace in the East China Sea region "so as to distract China's attention from the South China Sea and disturb the political landscape in the Asia-Pacific". The Malabar exercise started in 1992 with the navies of US and India in the Indian Ocean. Since Japan joined in 2007, it has alternated between the West Pacific and the Indian Ocean. The article said Japan wants to become a permanent member of the exercise to enhance its military cooperation with the US and find a solution to its dispute with China over islands in the East China Sea. "India hoped to enhance the anti-submarine capability of its navy that has tracked at least six Chinese submarines in the Indian Ocean region," it said quoting reports, adding "India also wants to disrupt China's military deployment in the East China Sea through these exercises". "However, the anti-submarine warfare of the US, Japan and India won't make them succeed in countering China as China has significantly improved its technologies in ballistic missile submarines and attack submarines. And with the development of multi-dimensional operations, merely elevating anti-submarine capability won't enable these countries to contain China," the article said. "The Malabar exercise has always been led by the US, with Japan and India being just partners with varied purposes. This will cripple the actual effects of the exercise. In fact, this kind of exercise is unlikely to impair China's presence in the East China Sea, except for flaring up tensions in the waters and producing frictions," it said.